OK, so it’s not February, sorry, but February was not good for favorite recipes. I don’t know what happened but I was in a bit of a rut with cooking. So I’m going to fall back on my favorite recipe for November and December. This became my go to recipe, I brought it to a couple parties and ate a ton of it at home. I even had meat eaters asking “are you sure there is no meat in this”. It’s a totally hearty and perfectly seasonal dish. It’s Nut Stuffed Delicata Squash – guess where I found this one?….. Sunset. I find so many good recipes in Sunset. 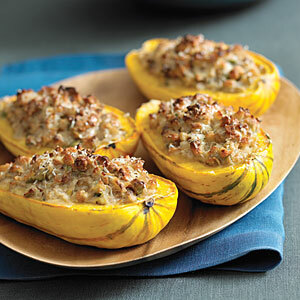 Anyways, this is such a yummy dish and one of the best parts is that you can eat the skin on the delicata squash. So this is a perfect dish to bring to a party and you can cut it into little bite size chunks to pop into your mouth. Another reason I love this dish so much is that I am able to get beautiful delicata squash from a local farm, Oak Hill Farm, right now the farm is closed but they are at our Friday Farmers Market. All Fall and Winter they’ve been providing me with beautiful, organic delicata squash. This dish is so hearty, it has walnuts, pistachios, almonds and pine nuts – yum. Some people may think that vegetarian dishes aren’t filling enough, which is not true, and this dish is there to prove those individuals wrong. I just pair it with a nice salad to balance out the warm, heartiness of the main dish. It’s a great cold weather dish.